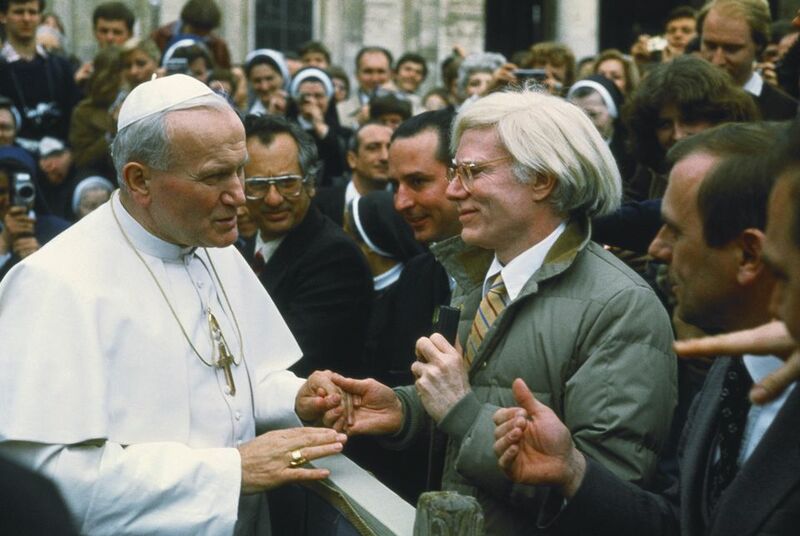 On April 2, 1980, Andy Warhol—lifelong Catholic—met Pope John Paul II at the Vatican. “Andy was wearing a tie and low-key version of his signature wig: both suggesting a sign of his respect,” Natasha Fraser-Cavassoni told me. She was the last employee that Warhol hired at his studio, and like other members of his inner circle—from his business manager Fred Hughes to filmmaker Paul Morrissey—was Catholic. Warhol will soon be going back to the Vatican. The Art Newspaper reports the Vatican Museums and the Andy Warhol Museum are finalizing a dual exhibition of Warhol’s religious works in Rome and the artist’s native Pittsburgh, planned for 2019. The Vatican Museums and the Andy Warhol Museum are finalizing a dual exhibition of Warhol’s religious works. Warhol owed that sense of detachment to his Ruthenian strain of Catholicism. This was the world of his immigrant mother, who accompanied him to Mass several services a week. At St. John Chrysostom in Pittsburgh, the priest’s Slavonic Mass was framed by the grand iconostasis, a white-paneled grid of “portraits of the saints,” according to Bob Colacello, one of Warhol’s biographers. “Very two-dimensional, with gold-leaf backgrounds...which is so much like his work, especially his portraits.” The hours of devotion and spectacle introduced Warhol to a mystical world that was his first experience with the transformative capabilities of faith and art. Warhol’s work was anchored in the cross. “Being brought up Catholic gives a sense of hierarchical order, discipline, and faith. Faith, when embraced, anchors the creative,” Ms. Fraser-Cavassoni said. Warhol’s work was anchored in the cross. His first grand religious works was a series of crosses in 1982: red and yellow, 90 by 70 inches, silkscreened against black. In other paintings, crosses are scattered. For Warhol, the world was suffused with Christ. He chose the paradox of representing that truth by illuminating those stripped-down crosses against an expanse of darkness—very much a light for the world. The Vatican’s exhibition should reveal that Warhol’s Catholicism was essential to his artistic vision of the body, of iconography and of the radical energy of faith. Warhol wasn’t being heretical when he placed General Electric and Dove logos onto Da Vinci’s Christ-centered canvas. He was creating his own iconostasis. He was sharing a world of ritual and symbol and, yes, salvation. What does it say about the world of art if it fails to realize Warhol’s religious vision? There is perhaps a more pressing question: What does it say about Catholics if they fail to see in Warhol’s art one of their own? Colacello said Warhol was a “religious artist for a secular society.” His return to the Vatican was inevitable. Warhol is going home. Answer: They realize Catholicism is much more than second rate art for profit. I, for one, am always astounded at how Andy was not so very creative, really, but in promoting himself his work became "aht" something of which there is little substance but, to be a special member of an adoring and exclusive club, one must acknowledge as superior. Really! How dare anyone who would impune the gifts of the naked artist-king before them point out the obvious. Now, I wait with baited breath for the theological insights evident in the work of Jackson Pollock. P.T. Barnum was correct! "Without promotion something terrible happens...nothing!" But who am I to judge? It may well be that double-talk and hucksterism leading to earthly status is of divine design but I think not. My, how we do worship our oh so special human beings... idols anyone? BTW, tomorrow, when you start the car, try to channel your inner Andy and consider the unholy yet beautiful clash of it all including The Earth which through The Fire gave rise to iron and along with The Air and the The Water in our mere bodies doth propel us in gilded carriages to feats of glory in our world....(fill in pretentious quotation in Latin *here*)... and then hold your head high in arrogance for your show of the mastery of intellectual superiority......or just drive off with the darn coffee mug in your hand. Egads!! Also, if you desire, I'll post pictures of myself in chapel this week so you'll know I am a good, good, good Catholic. An awful lot of snark just to make the point that you disagree with the Vatican Museum's decision to exhibit Warhol's artwork. You did say one correct thing: "who am I to judge?"